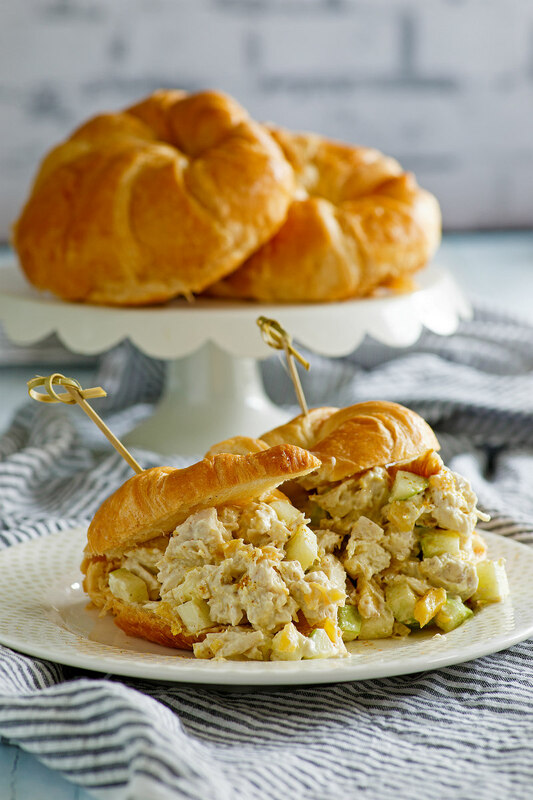 These Chicken Croissants are perfect for picnics and parties, but they also make for a super easy lunch or dinner too. 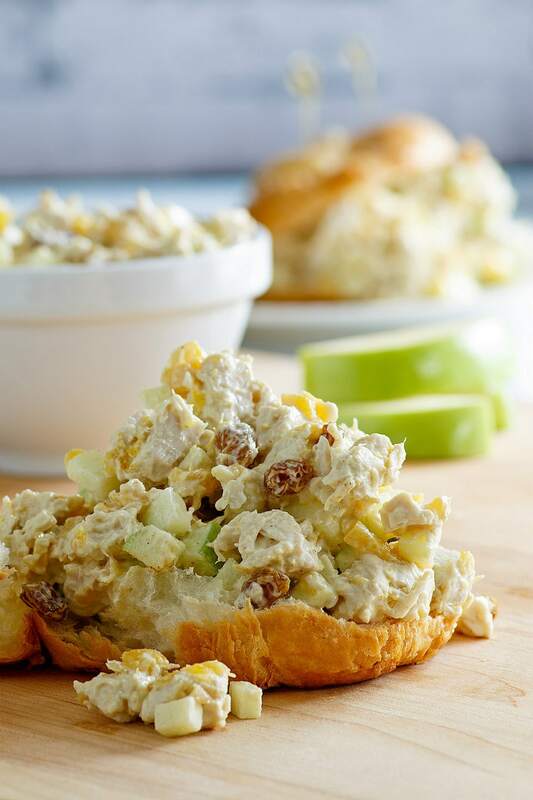 If you’re looking for a delicious, new chicken salad recipe to try… this is it. 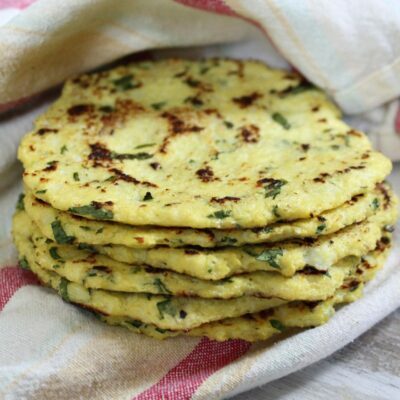 It’s one that is packed with crunch and lots of goodies. 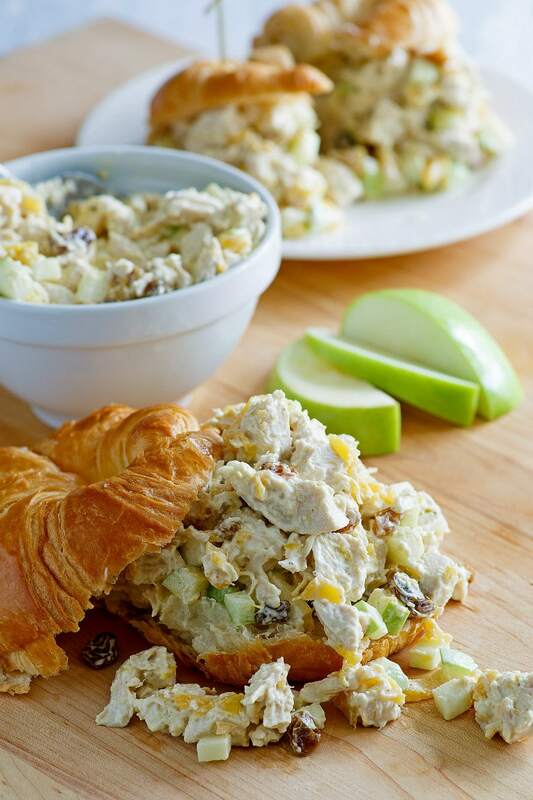 No plain chicken salad here. It’s full of delicious flavors like apple, pineapple, mango chutney, raisins, curry powder and a hint of orange. And it’s especially good when it’s tucked into a sandwich. 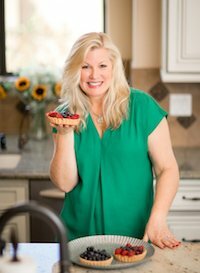 In this recipe, I’m calling for you to use croissants. Croissants are soft and buttery, and they just make a darn good base for a sandwich. 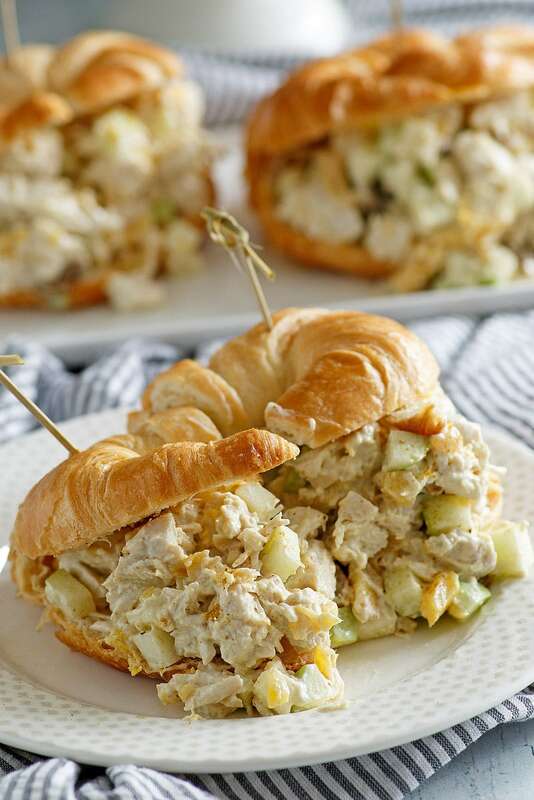 But you can certainly use any sort of bread for this chicken salad. 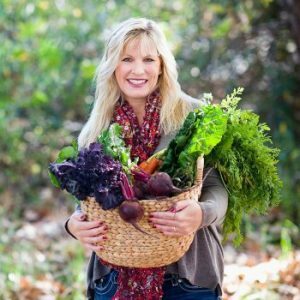 Heck, you can even use lettuce wraps! Let’s talk about croissants. They’re super easy to find. 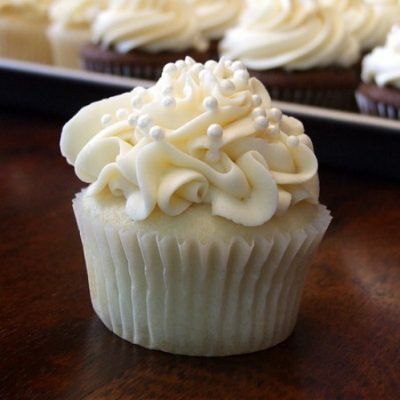 Look for them in your market’s baking aisle. My tip for you is to find the freshest croissants possible. Ask some questions in the bakery, and they’ll make sure you get your hands on the ones that were most recently made. 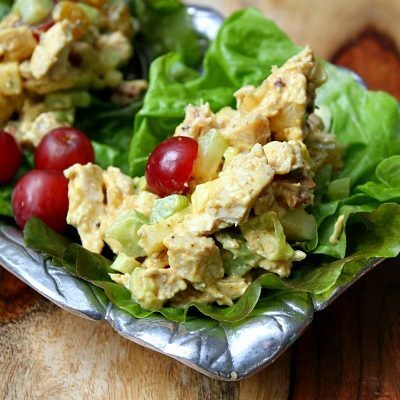 Mango chutney is an ingredient in this wonderful chicken salad recipe that you might not be familiar with. Indian in origin, it’s a sweet and spicy jam-type mixture that is sold in a jar in your market’s international food aisle. It’s basically fruit, vinegar, sugar and spices that have been cooked down into a thick, spreadable substance. 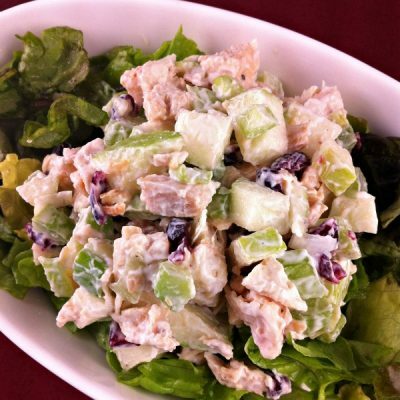 Don’t hesitate to pick it up for this recipe as it’s a tasteful addition to the chicken salad. At the end of this post, I share more recipes you can make with your leftover mango chutney. I mentioned that this might be an easy dinner or lunch recipe for you, and I do think that’s a great idea. 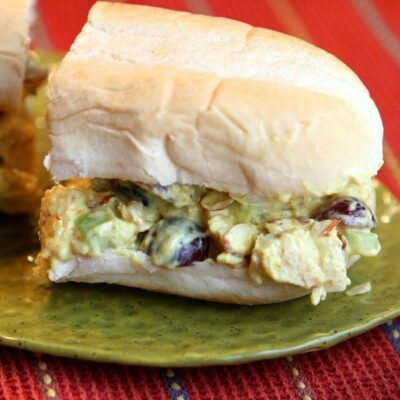 But these are also great sandwiches for parties. I’m thinking Super Bowl Sunday is a good day to make these. 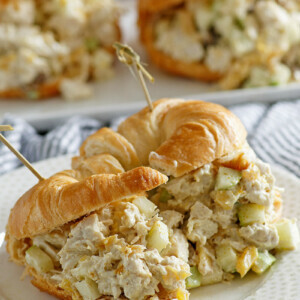 Everyone loves a good sandwich while watching football, right? My BLT Wraps and these Baked Ham and Cheese Sliders are good sandwiches for parties too. Add some Old Fashioned Macaroni Salad or All American Potato Salad, and you’ve got yourself a pretty good spread. 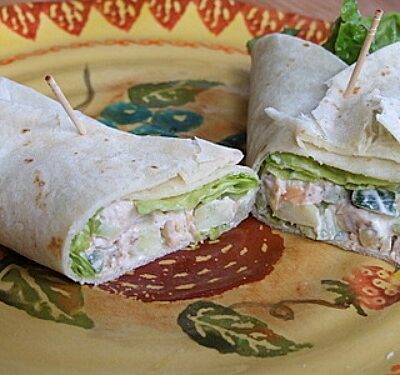 Another good way to serve these is to buy the large wraps and then cut them into smaller serving rounds. Be sure to use the mid-sized picks to keep them in place. You can pick up the mid-sized picks at party stores or places like World Market. For convenience, you can also order sandwich picks on Amazon and have them delivered to your door. I like to use them for mini fruit kebabs too. Enjoy!